EFT stands for Emotional Freedom Techniques. It is one of the fastest growing treatments in the world of energy psychology. Anyone can use it! Emotional Freedom Techniques are always at hand. It is so versatile you can use it for yourself, your family and children. It is used by counsellors, sports psychologists, motivational coaches and is incorporated in many fields of health care by therapists to support clients well-being. Very adaptable for life’s many experiences. When we are feeling emotional pain, stress or we are blocked in life, it is our life force, energy or Chi that is blocked in this aspect of our life. We can often feel where this blockage is located in the body when we feel our emotions. 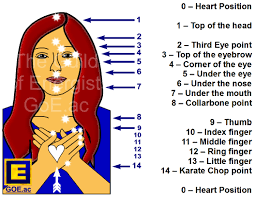 EFT works by Tapping on Energy points on the body, corresponding to major meridians or energy pathways. This releases the blockages and increases our energy flow or Chi. As a result our emotions are transformed. EFT is also commonly known as Energy Tapping. Focusing on positive emotions and the future orientation allows a fast and safe route to raising our energy into more empowered states and avoids a lot of time and pain reliving past painful memories and problems.